The majority of buildings within the University of Cambridge estate have water systems within them. Under the “Legionnaires' disease. The control of legionella bacteria in water systems” Approved Code of Practice 2013 (ACoP L8) there is a duty to manage all water systems. Throughout the University of Cambridge, there is an ongoing programme of activities in place to support the safety arrangements for controlling the risk from water borne bacteria. This water safety website’s purpose is to inform, raise awareness of the arrangements and provide information for managing Water Safety within the University of Cambridge estate. The University of Cambridge recognises and accepts its responsibility under the Health and Safety at Work Act etc. and the Control of Substances Hazardous to Health Regulations, to take all reasonable precautions to prevent or control the potential of legionellosis to students, residents, staff and other persons working at, using or visiting its premises. The University recognises its responsibility to implement, in full, the Codes of Practice and all other relevant and associated documentation, particularly ‘Legionnaires' disease. The control of Legionella bacteria in water systems, Approved Code of Practice and guidance, L8’. Review the The Water Standard document at least every two years or when new developments arise. 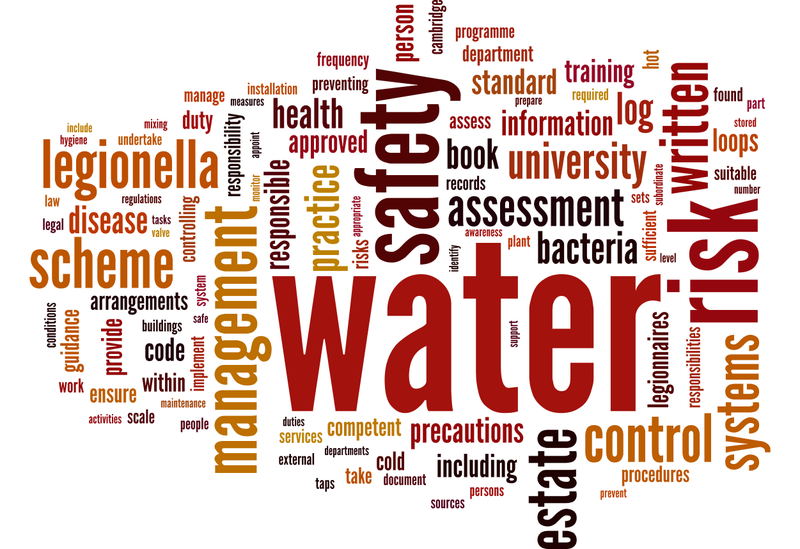 Without exception, the The Water Standard and its implementation, shall apply to all persons occupying buildings under the Central University’s direct control, as denoted in the framework established within the University’s Health and Safety Standard. NB: Autonomous corporations and institutions within the University including college properties and domus areas have their own duty and responsibility for the management of their own health and safety risks, with their own policies and procedures, which should include control of Legionella and other water borne pathogens. In brief, general duties under the Health and Safety at Work etc Act 1974 extend to risks from legionella bacteria, which may arise from work activities. The Management of Health and Safety at Work Regulations 1999 provide a broad framework for controlling health and safety at work (see www.hse.gov.uk/risk for more information). More specifically, the Control of Substances Hazardous to Health Regulations 2002 (COSHH)3 provide a framework of duties designed to assess, prevent or control the risks from hazardous substances, including biological agents such as legionella, and take suitable precautions. The EM Water Safety Team provides a service in Water Safety Management in conjunction with the University's Safety Office. EM carries out an on-going programme of risk assessment and remediation. We provide an information and guidance service to any person about to embark on work which may disturb water systems and liaise closely with all departments regarding their internal safety arrangements.